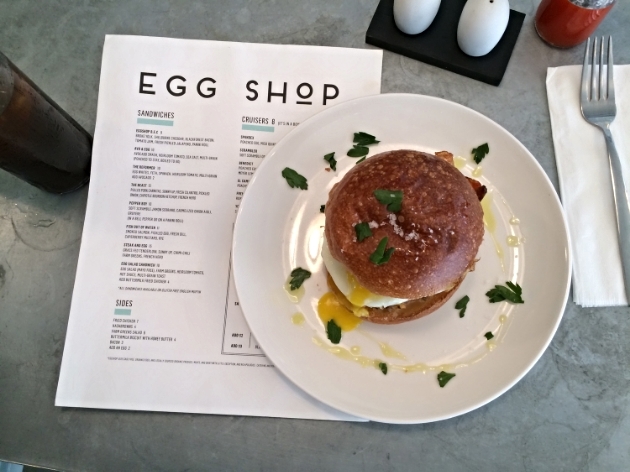 Eggs all day is the theme of the new Nolita gem Egg Shop. A pleasant space to get your egg on. I stopped in twice last week and loved my eggcelent eggsperience. The EggShop B.E.C ($10), broke yolk, Shelburne cheddar, Blackforest bacon, tomato jam, fresh pickled jalapeño on a panini roll tasty. Had a kick of spice, sweetness, and saltiness. The Spandex ($10), a bowl with poached egg, miso quinoa, farm greens, avocado, and pickled carrot was fabulous.